· Warriors from Kenya, Wilson and Jackson: on their first trip ever to Chicago. · Free The Children co-founder Marc Kielburger: This motivational leader is stoked to share the mission of the organization as well as the goal of bringing its popular, star-studded We Day event to Chicago. It was our great pleasure to interview Matthew Corrin. We'll have our interview with Freshii's enthusiastic, young CEO up shortly. 5 winners will get green bowls, good for repeated meal discounts at all Freshii locations nationwide. Check out our original photo feature here. Our favorite shots are embedded at the bottom of this post. I'm stuck in the middle. I was a full blown vegetarian for 10 years, but now that we have a family, we compromise and aim for healthy, locally sourced food and little red meat. I'm stoked that Freshii has options for all tastes and diets. I had a chance to taste their vegan wrap and it was flavorful and seriously delicious. Vegan doesn't have to equate "tastes like packing peanuts", costs a fortune, or takes a long prep time. 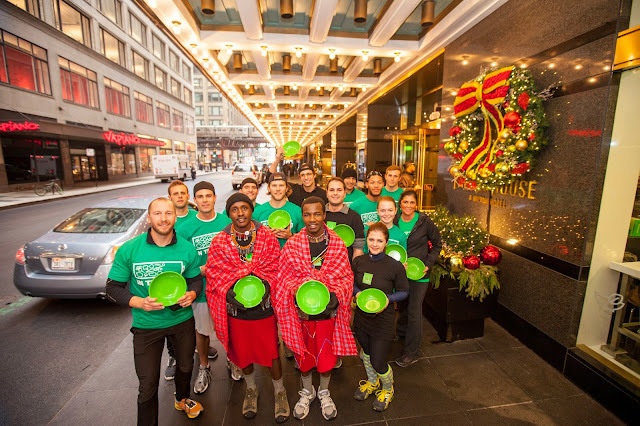 December 4th, right here in Chicago, Freshii announced a cause partnership with Free The Children. ChiIL Mama met up with them for lunch at the Freshii in the Palmer House Hotel. 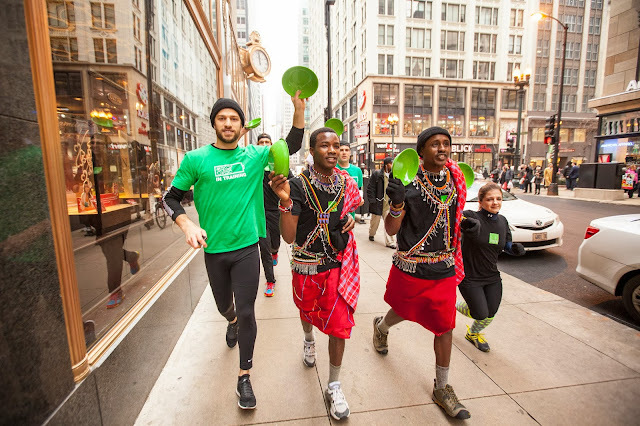 Prior to the lunch, Wilson Meikuaya and Jackson Letasuna from rural Kenya led a fun run – dressed in traditional red shukas with loads of beaded jewelry – to Freshii locations throughout the city to symbolize health, wellness and nutrition. 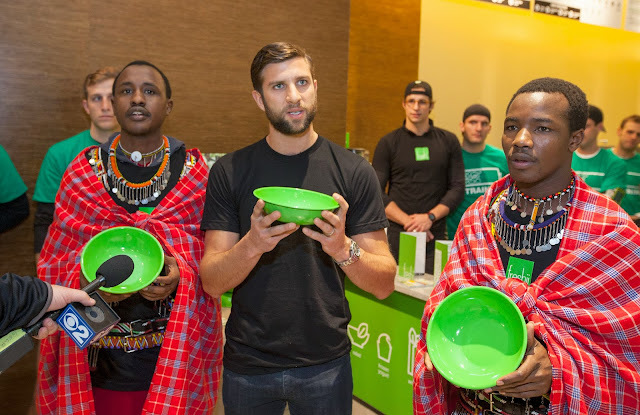 This month, Freshii customers can purchase a $5 limited edition reusable bowl, with proceeds going towards building school kitchens and vegetable gardens in third world communities. Customers will receive a discounted meal every time they bring the bowl back.